If slam dunk, hoop play and balling is your thing then you’ll want to score with the very best basketball sneakers this season. Whatever your playing level, grabbing any old pair of sports sneakers just won’t do. From on-court performance to all-around street style, the basketball shoe you choose can make all the difference to how you play….and stay the distance. For a fast-paced game like basketball, you need support and stability to help you play harder, faster and stronger. And let’s not forget, you need to look good too. So, why not take a steer from Gear Hungry’s best basketball sneakers Top 10, and there’ll be no need for your new footwear choice to be taken down to the wire. The Curry 3 men’s basketball shoes take the Gear Hungry Best Choice slot thanks to their handsome styling and all-round performance, both on and off the court. These eye-catching sneakers will enhance any player’s game, whether it’s hanging out with the driveway hoop or steaming to the key on a competitive court. The spec for a totally reliable performance basketball shoe is all there and the Curry 3 certainly gives you a lot of on-point game-play for your buck. Its rubber sole and herringbone tread give superior traction and is firm enough to cope with an outdoor court while there ’s enough internal cushioning for excellent stability, without losing the feel of the ground. High tensile threads in the synthetic upper give a robust feel but with enough flexibility to support a good range of movement while a firm level of internal cushioning makes this a great basketball shoe for the speediest of players. 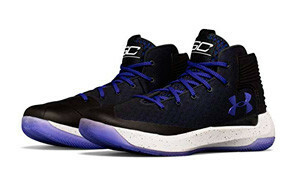 What you also get with this Under Armour shoes is a quality foot lock down – the asymmetrical lacing system feels secure; the heel counter does its job more than adequately and the well-designed high top ankle means your feet are not going anywhere! For a great value, high performing sneaker, the Curry 3 is one of the best high top basketball shoes to make our shortlist. There’s a Spider-Man vibe about this handsome Adidas shoes which follows in the footsteps of the popular Crazy Explosive range. As the name suggests, this awesome basketball shoe is the go-to if your play is power-driven – whether in explosive sprints or as a total hoop monster. The rubber outer sole is molded for a glue-like stability that is best suited to hardwood courts but allows enough glide to turn and blast when the tempo changes. The upper comes with a sock-like ankle cover made from synthetic Primeknit for a good level of comfort and flexibility. While the internal cushioning includes a support system akin to a roll cage, reinforcing the shoe’s stability and keeps your foot cradled like a baby as you turbo-charge through the game. The fit of this cool-looking sneaker is true to size although with its slim design, it doesn’t quite breathe as well as some others. But at a price that won’t have you begging your bank manager to buy, we think this is one of the top-rated basketball shoes out there. Make a statement with the Nike Air Jordan XXX1, over 30 years after the original hit the basketball court. One of the lightest Jordan basketball shoes on the market, the XXX1 is certainly not the shy and retiring type, and the bold high top version demands to be noticed, with a mega choice of colors, emblazoned with the distinct Jordan styling. But as a Nike sneaker forever linked with the MJ legacy, does the XXX1 lead on the basketball court? We think it does. This is a top quality basketball sneaker best suited to the more explosive player, whose turns on the court are as eye-catching as his footwear. The Air Jordan XXX1 aims to give you the confidence to push your play, knowing your basketball footwear has your back when it comes to foot stability, security and protection. With the original Foamposite launched in 1997, this is a super-performing basketball shoe that’s stood the test of time. As a mid top basketball sneaker, the classic design was built for a full-court performance and the Pro version enhances that ‘cover all ground’ style of play as you eat up the hardwood. The Foamposite Pro is a classic that’s also up-to-date when it comes to design and function and for its price tag you get a whole lotta cool basketball shoe. 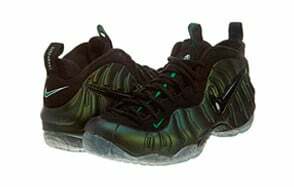 It’s iconic Foamposite upper, stitchless design and bold styling cannot fail to catch your eye, with a superb range of colors, from moodily subdued to full-on golden bling. You’d be proud to wear these bad boys from locker room to the street, but the Foamposite Pro is not just about the swagger, these are top athletic shoes primed to get you attacking the hoop. 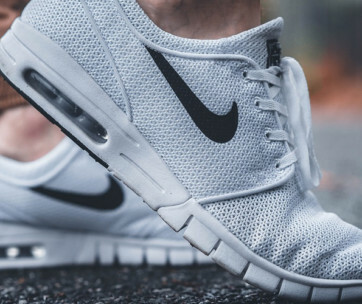 Be sure to also check out our list of the best white sneakers for more great items like this. 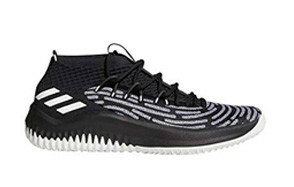 A tribute to Harlem and named after NBA star player Damian Lillard, the Dame 4 is an eye-catching mid top basketball sneaker with the adidas pedigree that makes it a great value hardcourt shoe. Inspired by Damian’s tough but controlled playing style, the Dame 4’s mid top ankle support means it’s one of the best Nike basketball shoes for the all-rounder, taking sprints, turns and jumps in its stride. The sock-like collar keeps the foot secure but allows enough ankle movement to perform some decent basketball aerobatics while the rubber sole gives you enough traction. The Dame 4 design aims to keep things light with a natural feel on your feet and the textile uppers allow for enhanced breathability when you need to let off some steam. The bootee collar is snug so could take a few wears to get used to, but once it’s molded to the shape of your feet, donning the Dame 4 is a breeze and will have you flying on the court. Our handy guide to the best tennis shoes features more great products like this. Now this basketball shoe from Nike is a total blank canvas…quite literally! The minimalist styling of the Jordan Why Not Zero.1 is not just there to keep you white cool but invites you to stamp your own mark. This decent-priced sneaker comes with a set of permanent markers, so you can go basketball creative and make these shoes your own. Aside from the DIY artistry, these basketball sneakers are unconventional in their futuristic styling, with a distinct wraparound high top that is reported to give first-rate ankle containment and support without restricting movement on the court. An internal lacing system keeps your feet streamlined and ready to fly. The tech spec is impressive for the price tag – with great traction, cushioning, fit, support and foot lockdown. The shoe’s tread means it’s best suited to an indoor hardwood court and the snug fit keeps the internal ventilation a little limited but for an iconic basketball sneaker with enough flex to keep up with the fastest play you can’t go wrong with the Zero 0.1. Love this shoe? Check out our review of the best Puma Shoes for our top picks. Now here’s a total workhorse of a basketball shoe that’s going to get you to full-time, time and time again. The Drive 4 manages to avoid sacrificing its game-on good looks to create a sturdy sneaker that can take whatever you throw at it. 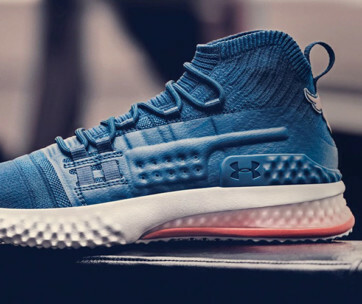 Despite its substantial frame, this basketball shoe from Under Armour is remarkably lightweight and breathable, keeping your feet cool as you work up a sweat. This great value high top has all the internal support you need for fast and furious play, while its external heel counter keeps the back of your foot firmly where it should be. Its slick front toe wrap helps to give more forefoot stability, keeping you grounded as you get into the twists and turns of a forward-driving game. In short, the Drive 4 basketball sneaker is great for all-round players who are ready to up their game when the heat is on. Works well on both hardwood and multi-purpose courts. Find more great products like this by checking out our guide to the best skateboard shoes. The True Flight is a true gem of a basketball shoe – great value with street looks that can step it up when the play is on. This neat high top is a great all-round shoe, taking you from practice to the mall, without breaking a sweat. In soft nubuck leather and with color options not easily found in other shoes, you are on to a style winner. Retailing for around $100, can the True Flight also perform when the real game is on? Pretty much and its all-round ability means it can cope with both indoor and outdoor courts. They do look chunky, but the True Flight basketball shoe is surprisingly light and super-easy to put on and take off. When on, they hug your foot like a baby, thanks to a neoprene inner sleeve and the leather upper is both durable and breathable. And finally, the comfort fit midsole and full-length Air Sole unit work tirelessly together to soften every slam-dunking blow as you land on the court. Now that’s teamwork. If you are looking for a comfortable footwear, then check out our guide to the top spikeless golf shoes. The Nike Lebron Soldier is a confident laceless basketball shoe that features an innovative support system to keep your foot totally locked in. The result? Superior fit and stability that keeps your foot in position as you switch up your speed and play. The versatility of the Soldier makes this one of the all-time best basketball shoes for players of all abilities and its futuristic styling will certainly please the fashion conscious. The laceless system – replaced by four hook-and-loop straps – can make this shoe a squeeze to get on initially, but the system soon wears in, making kitting up and getting on court a joy. And the shoe’s substantial sole provides a reliably stable base to keep you balanced as you cut, stop, sprint and dunk your way onto the scoresheet. You can find more amazing sports shoes in our Asics shoes review. The Nike Kyrie Flytrap is happiest when it is streaking down the length of the hardwood making it one of the best basketball shoes for speed players in this review. Its mid-top design gives just the right amount of ankle freedom to pick up the pace while its curved outsole boosts traction on those lightning cuts and transitions. Almost all reviewers report this is a basketball shoe that is good to go out of the box and, with minimal wear in time, it is busting to do the job. The Flytrap’s a great priced Nike basketball sneaker that looks good on or off the court. Traction-wise however, it’s better suited to indoor surfaces and the lightweight design leaves the midsole cushioning on the slimmer side but for overall comfort, stability and speed, the Flytrap is one to catch. Don’t forget to check our Reebok shoes review, for more great shoes options. From a friendly knockabout to a full-on slam dunk of a competitive match, the type of basketball shoes you choose will make the difference to your play. Price – when it comes to value, you need the right features for your game rather than going for the cheapest you can get. Playing Style – before adding the flash to your feet, you need to know how you play and how you want your game to progress. Personal playing style makes the difference when it comes to choosing basketball shoes. Are you a long-range shooter or do you like to be up front in the key? Is your playing style based on speed and sheer, turn-on-a-dime agility or are you out back and ready in defense? Match the specific spec of your basketball footwear to your own playing style and you’ll get all the support and performance you need to keep your game on target. Ankle Support – with fast-paced play, your ankles take the strain out on the court. Sprints, sharp stops, twists and jumps all put pressure on the ankle joint and you need to ensure your new basketball sneakers provide the right level of support. A quality pair of basketball shoes will be made out of stiff outer material to stop your foot and ankle from rolling and twisting during constant lateral moves and fast changes of direction. There should also be ankle cushioning to keep your whole foot stable. The type of ankle support you choose depends on the type of player you are –aggressive players need the greater ankle support that’s found in high top shoes while all-rounders can choose to dial it down. Cushion – the right cushioning in your basketball footwear is not just about comfort, it’s also about protecting your feet’s most vulnerable pressure points such as the heel and forefoot. Most basketball shoes go for mid-level cushioning to help keep a solid base for your foot on the court. 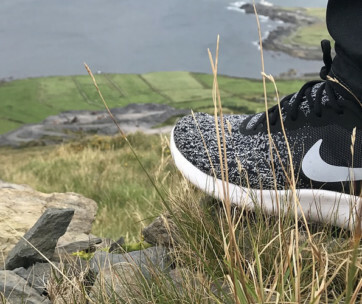 Materials used for mid-sole cushioning include lighter EVA foam and compressed EVA foam or the denser – and more durable – polyurethane, while air-based cushioning can provide a more responsive ‘ride’. Fit – your basketball shoes should feel snug but not too tight, to allow for the natural movement of your foot through a range of turns, sprints and stops. For your perfect fit, get your feet measured at your sports shoe store then try on the sneakers with the socks you’ll wear to test the fit before you buy. There should be a small amount of space between your big toe and the end of the shoe and your heel shouldn’t slip when you walk or run. Durability – whether you’re out in the park, using the driveway hoop or playing full-on in a competitive match, your basketball sneakers will need to be able to weather some serious hard play. Make sure your new shoes are tough enough for your playing style and have the right features such as a hardwearing outer sole and grip that’s matched to your preferred court surface to enhance their durability. Material – the materials used in your new basketball shoe can make a real difference in terms of comfort, performance and durability. Leather is a traditional material used for sneaker uppers, offering stability as well as longer term durability. But it can be on the heavy side and so manufacturers also use synthetic mesh, which is durable but more lightweight and breathable, without compromising on foot stability. There’s also hybrid shoes, mixing leather with synthetic mesh or canvas. The outer sole of a basketball shoe is usually made of rubber, with varying densities and thickness to create the right level of traction matched to the court surface. Weight – When it comes to the weight of your basketball footwear, it needs to be a balance between comfort and strength/stability for overall foot grip and support. If speed and agility is the key to your forward playing style, then opt for one of the lightweight shoes while for the power players who need full ankle support, a heavier shoe will give you all the stability you need. Basketball shoes fall into three categories – low, mid and high tops – referring to just how far the sneaker laces up on the ankle. When choosing which type, it depends on not only your playing style but also your personal comfort and preferred fit. It goes without saying all three styles look good when away from the court so don’t let fashion dictate your final choice if your game play matters. Low tops – as the name suggests, low tops finish just below the ankle bone and are similar to standard sports shoes. Low tops are the lightest basketball shoes designed for speed and agility as the ankles are free to pull off fast turns and devious dodges on the court. They are ideal for speed demons; however, they offer little in the way of true ankle support. Mid tops – Sitting right at the ankle, mid tops are the happy medium for players who want the foot freedom for some jumping but still need to turbo up when it comes to bursts of speed. Mid top basketball shoes offer some ankle support without the restriction of an all-enclosed design. Mid top basketball sneakers are best for all-round players who like to shake their style and playing position up. High tops – the iconic basketball shoe with the design most associated with the game, high tops are the heaviest basketball footwear, but they provide superior ankle support when you need it the most. With high tops, the upper wraps around your ankle to give you substantial support and stability. High top basketball shoes are best suited to the more aggressive player whose M.O is power sprinting and jumping to blast the ball into the hoop. But out on the street, these dudes always look retro cool. A sneaker designed specifically for basketball is essential to your overall performance. Simply put, trying out in a normal sport or athletic shoe simply won’t do. Get into a fast and furious game of basketball in an ordinary pair of sneakers and you run the risk, not only of seriously poor play, but potential injury and strain. Your basketball footwear are your essential piece of kit and the shoe you choose matters. Unlike many other sports, basketball requires both speed and small space fast movement as well as jumps and twists and your feet need to be supported to smash it every time. The best performance basketball shoes are specifically designed to give you the right level of ankle support, stability and freedom of movement, minimizing the risk of strains and injury as you go into game overdrive. Q: What Are Basketball Sneakers? A: Basketball shoes are designed to deal with the specific intensity and range of movement needed for the game. With the average basketball player switching direction every few seconds and running well over 100 sprints per match, it’s no wonder a sport-specific shoe is needed to help you survive the rigors of the game. Unlike more streamlined and low-profile general sport shoes, your typical basketball sneaker is a more bulked up, look at me dude. Whether you opt for low, mid or high top, your basketball shoe is there to give sufficient support, specifically around the ankle when jumping, twisting and sprinting and so has a larger profile and design. Q: How Much Should I Spend On My Basketball Shoes? A: With basketball shoes you are buying a key part of your equipment and the right pair of sneakers will have you highflying on the court. So, when considering your budget, if your new footwear is for serious basketball play rather than fashion, then go for the best pair you can afford. With such a vast choice currently out on the market, there is no need to break your bank to get the spec you need, and you can get a decent pair starting from around the $75-$100 mark. Go for one of the quality brands and check out their full range so you don’t get your head turned by a design or style that simply won’t add to your game. Know your playing style, the type of court you play on and how often you play, and you’ll find the right basketball shoe for your budget. But remember, your sneakers are central to both your game and helping to keep you injury free and are a good investment. Q: How To Prevent My Shoes From Smelling? A: Like any hardworking sports shoe, it won’t take much for your prized new basketball sneakers to start smelling less than minty fresh. You’ll want to push your footwear as you work up an on-court sweat but you also need to prolong the life of your new sneakers without having to banish them to the outside porch. The first tip is to never go barefoot in your basketball shoes, the right sports sock can work wonders in the ‘keeping your feet sweet’ department. The odor kicks in when your footwear gets damp and isn’t allowed to dry out, meaning the smelly bacteria starts to take hold. Synthetic socks that wick away moisture will help with the odor control. Take off your shoes as soon as the game is over, to give them space to breathe, then store your basketball shoes in a cool, dry place. If you can, take out the inner sole to prevent the stinky bacteria from making your sneaker their home and replace the sole insert regularly to keep your feet sweet and your basketball shoes in tip top condition. Q: Which Socks Should I Wear With My Basketball Sneakers? A: Socks are essential to your basketball sneakers’ performance as they add extra protection against blisters and pressure, while helping to keep your hardworking feet cool and dry. Depending on the level of cushioning you want, you can choose from a variety of sport sock thicknesses – it’s a matter of personal preference, just make sure you don’t lose the natural flexibility and required movement in your foot. And try out your new sock/shoe combo a few times before you take to the court for that really important game. Choose a sport sock that works with the height of your basketball shoe to prevent friction and rubbing. You can also choose designs that give you extra cushioning and support in more delicate areas, such as the heel and forefoot. And finally, always opt for synthetic socks rather than cotton, for superior sweat-wicking properties and you will keep your feet and your game totally fresh.